"On a recent Saturday night, I went to the movies. 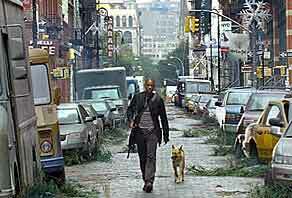 Walking past the theater showing 'I Am Legend' (plague kills most of humanity), I opted to watch 'Cloverfield' (inexplicably angry alien destroys Manhattan) instead. After sitting through back-to-back previews for 'Hellboy II: The Golden Army' (ancient truce between Hell and Earth is revoked, resulting in mass destruction) and 'Doomsday' (lethal virus ravages England, a disease-ridden cinematic cousin to '28 Days Later' and 'Children of Men'), I found myself disturbed. The End of Days suddenly seemed imminent. Should I cancel my post-movie dinner reservation? What's with all this apocalyptic entertainment, I wondered, and what does it say about those of us who are filling the theater seats?" Recall, however, that in 2003-2004, many movies came out that dealt with the occult. (Hellboy, Constantine, etc.) I had a similar reaction, but then again, Hollywood likes to imitate itself, and here we go with apocalypse theme now. Although the topics are not the most pleasant, and some may say that the prevalence of these topics in movies in the work of the devil, Truth still shines through somewhere, if we are looking for It and open to It.